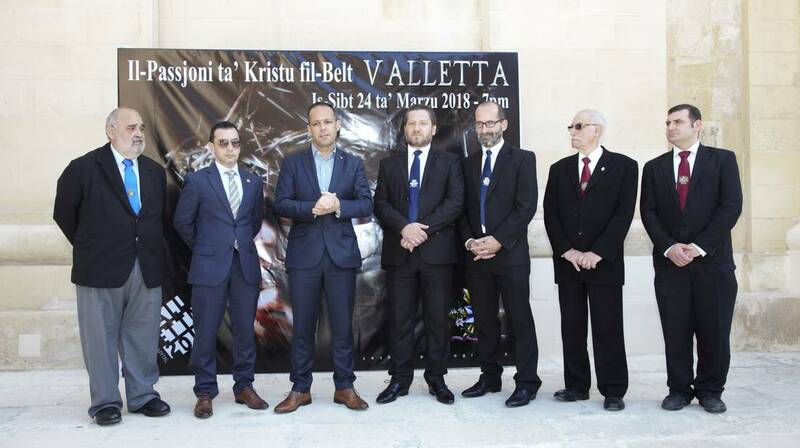 During this morning's press event for "The Passion of Christ"
The Valletta 2018 Foundation, together with Għaqda Kultura u Armar, presents ‘The Passion of Christ in Valletta’ – a pageant along the main streets and squares of Valletta on Saturday March 24th, 2018, at 7pm. The pageant will start at the Grandmaster’s Palace (The President’s Palace), and will move along Republic Street, Melita Street, Merchant Street, St Christopher Street, returning back to Republic Street. The passion of Christ comes to an end on the parvis of St John’s Co-Cathedral, where Christ’s final moments are seen in the form of a musical. Around 400 biblical characters, both from the Old Testament as well as from the New Testament, as well as live animals will be participating in this pageant. For this special occasion, a new, original song has been composed, with lyrics from renowned Maltese poet Ray Mahoney and Mark Tonna, and music by Andrew Zammit. A dialogue between Joseph of Arimathea and Nicodemus, St John and Our Lady, has also been written for this production with the help of researcher, Ramon Fiott. Renowned local singers taking part in this production include Debbie Scerri, Eleanor Cassar, Lydia Grech, Renato Vella, Stephanie Vella, Nazio Rotin, Malcolm Camilleri, Steve Camilleri, Ishmael Grech, Charlene Cardona and a children’s choir. Three local band clubs will also be participating in this pageant: Marija Annunzjata Band Club of Tarxien, Beland Band Club of Zejtun and King’s Own Band Club of Valletta. At 6.30pm, the former two will be playing funeral marches starting from Auberge de Castille, and walking down Merchant Street towards the Grandmaster’s Palace. Meanwhile, King’s Own Band will be playing funeral marches while walking from the Old Opera House toward the Grandmaster’s Palace, from where the band will then be accompanying the procession along its route.